Genocide refers to efforts to destroy a national, ethnic, racial, or religious group of people either entirely or a substantial portion thereof. This practice has been all too common in human history. Even biblical examples exist, in some of which the God of the Israelites ordered them to destroy other tribes. Many historical occurrences were considered justified by the perpetrators, based on their need for sufficient lebensraum for their own society, with the "other" people viewed as inferior and a threat to the smooth functioning of their society. However, such reasoning is no longer considered acceptable. Genocide has been deemed criminal by the United Nations, as well as numerous individual nations. As human beings have moved toward an increasingly globalized society, it has become necessary to break down the barriers that divide people. To overcome genocide, people must learn to live together as one harmonious human family, guided by loving parents, so that man no longer kills his own brother. The term genocide was coined by Raphael Lemkin (1900–1959), a Polish Jewish legal scholar, in 1943, from the roots genos (Greek for family, tribe or race) and -cide (Latin - occidere or cideo - to massacre). any of the following acts committed with intent to destroy, in whole or in part, a national, ethnic, racial or religious group, as such: Killing members of the group; Causing serious bodily or mental harm to members of the group; Deliberately inflicting on the group conditions of life calculated to bring about its physical destruction in whole or in part; Imposing measures intended to prevent births within the group; and forcibly transferring children of the group to another group. Lemkin's original genocide definition was narrow, as it addressed only crimes against "national groups" rather than "groups" in general. At the same time, it was broad in that it included not only physical genocide, but also acts aimed at destroying the culture and livelihood of the group. Genocide appears to be a regular and widespread event in human history. The phrases "never again" and "not on our watch," which have often been used in relation to genocide, have been continually contradicted. Determining which historical events constitute genocide and which are merely criminal or inhuman behavior is not a clear-cut matter. Furthermore, in nearly every case where accusations of genocide have circulated, partisans of various sides have fiercely disputed the interpretation and details of the event, often to the point of promoting wildly different versions of the facts. An accusation of genocide is certainly not taken lightly and will almost always be controversial. Revisionist attempts to deny genocide are, in some countries, penally repressed. The following are some examples of genocide occurring at different times in history, throughout the world. They include Biblical genocide, atrocities perpetrated in the Roman Empire, the Americas, the African Congo and Rwanda, Europe in Germany, and the Armenian genocide by Turkey in the Middle East. The conquest and massacre of various Middle Eastern peoples, by the empires of Assyria and Babylon. Perhaps the ultimate genocide is recorded in the book of Genesis, when God determined to "make an end of all flesh" (Genesis 6:13) through the Flood, sparing only Noah and his family, instructing him to build an ark that would keep his family and pairs of living creatures safe (Genesis 6:14-22). According to this account, God destroyed all people because of their evil and corrupt ways, saving only one righteous family. The account goes on to record that God then made a covenant with Noah and his sons, affirmed by the rainbow, that never again would such destruction of life occur. Julius Caesar's campaign against the Helvetii (inhabitants of present-day Switzerland), in which approximately 60 percent of the tribe was destroyed. Julius Caesar's campaign against the Gauls (inhabitants of present-day France) under Vercingetorix: over one million (probably one in four of the Gauls) were killed, another million were enslaved and 800 cities were destroyed. The entire population of the city of Avaricum (Bourges) (40,000 in all) was slaughtered. Carthage: the city was completely destroyed in the Third Punic War, and its people killed or enslaved. Jerusalem: the city was burned in the Destruction of Jerusalem and its people killed or enslaved. The long-term decimation, sometimes by government policy and sometimes not, of the indigenous peoples of South and North America by Europeans is estimated to be one of the largest and longest lasting genocidal events in history. Various estimates of the pre-contact native population of the continental U.S. and Canada range from 1.8 to over 12 million. Over the next four centuries, their numbers were reduced to a low of 237,000 by 1900. It has been estimated that the native population of what is now Mexico was reduced from 30 million to only three million over the first four decades of Spanish rule. European persecution of natives started with Christopher Columbus' arrival in San Salvador Island in 1492. Native population dropped dramatically over the next few decades. Some were directly exterminated by Europeans; others died indirectly as a result of contact with introduced diseases for which they had no resistance. Over the next four centuries, European settlers systematically displaced Native American peoples, from the Arctic to South America. This was accomplished through varying combinations of warfare, the signing of treaties (of which the natives may not have fully understood the consequences), forced relocations to barren lands, destruction of their main food supply—such as the bison—and the spread of European disease, notably smallpox. In the 1880s, Argentine President Julio Roca launched a campaign to exterminate the Indian population of the Pampas and the Patagonia regions. The offensive led to the death of some 20,000 Indians. The Beothuk people, an aboriginal group, native to the province of Newfoundland in Canada, are now completely extinct as a result of extended low intensity conflict with European colonists (mostly fishermen who regarded them as thieves), loss of habitat, and importation of diseases such as tuberculosis. As European settlements grew, the Beothuks withdrew into the interior of the island and starved. Activities of European colonists and importation of previously-unseen diseases caused many deaths in other Canadian native communities; the Beothuk are unique in Canadian history as having suffered not only genocide but outright extinction. Tragically, their "genocide" is unique in the sense that it appears to have been a drawn out and unintentional exercise founded in mutual distrust and ignorance. It was not a modern "genocide" in the sense there was no intention or even conscious effort to drive them to extinction. The process was the result of complex relationship dynamics and the peculiarly tenuous ecological nature of the island. The issue of genocide against the aboriginal peoples of Canada (during the conquest of "turtle island" or the North American continent) has received international attention from various human rights organizations. Principal testimonials from thousands of Aboriginals compiled by former United Church of Canada minister, Reverend Kevin Annett, and his Truth Commission into Genocide in Canada has added considerable merit to this revelation. The War of the Triple Alliance (1864-1870) almost totally destroyed the Paraguayan population and ended the relative development that took place during its first decades of existence. It is estimated that 300,000 Paraguayans—including a very high proportion of men of military age—were killed. Throughout the nineteenth century, Native Americans were driven off their traditional lands to facilitate the installation of settlers. On some occasions, entire villages were massacred by the U.S. Army. Tribes were generally relocated to Indian reservations, on which they could be more readily pushed toward assimilation into mainstream U.S. society. The Conestoga (Susquehanna) tribe of the lower Susquehanna Valley of Pennsylvania was completely annihilated by the "Paxton Boys" Scotch-Irish militias at the end of the French and Indian War in 1763. The last survivors of the tribe sought and were granted refuge in the Lancaster County jail. The Paxton Boys forced their way in and massacred them. The liquidation of the Conestogas is documented by Benjamin Franklin and in "The Light in The Forest" by Conrad Richter. Prior to its being taken over by Belgium to form the Belgian Congo, under the rule of King Léopold II, the Congo Free State suffered a great loss of life due to criminal indifference by Europeans to its native inhabitants in the pursuit of increased rubber production. The 1941 massacre at Babi Yar was similar to many other mass killings of Jews. Over 33,000 Jews were shot in the course of two days by Nazi Einsatzgruppen and local Ukrainian forces. Nazi genocide before and during World War II and the Holocaust (1933–1945) resulted in the systematic extermination of upwards of 11 million people. The main targets of the Holocaust were the Jews of Europe, of whom between five and six million were killed, , including 1.5 million children, in what was called by the Nazis the "Final Solution of the Jewish Question." Other targets of the Holocaust included Poles, Roma, Serbians, Slavs, homosexuals, and political opponents such as communists. The resources of a major industrial power, Germany, were harnessed to industrialize mass murder. 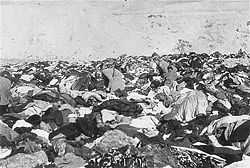 Jews and other victims were massacred in massive open air shootings by the organized killing squads called Einsatzgruppen, or they were confined in ghettos before being transported to extermination camps where they were killed. in view of these new crimes of Turkey against humanity and civilization, the Allied Governments announce publicly to the Sublime Porte that they will hold personally responsible for these crimes all members of the Ottoman Government, as well as those of their agents who are implicated in such massacres.. The Armenian Genocide was conceived and carried out by the Ottoman Empire from 1915 to 1923, resulting in the deportation of nearly 2,000,000 Armenians, of whom 1,500,000 men, women, and children were killed, 500,000 survivors were expelled from their homes, and which succeeded in the elimination of the over 2,500-year presence of Armenians in their historic homeland. " The Turkish Government disputed this interpretation of events and maintained that crucial documents supporting the genocide thesis were actually falsifications . Armenians around the world mark the genocide in different ways, and many memorials have been built in Armenian diaspora communities. 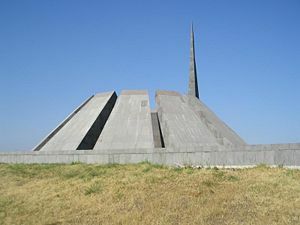 A national memorial was built in 1967 in Yerevan, the capital city of Armenia, and each April 24 (Armenian Genocide Commemoration Holiday) hundreds of thousands of people walk to the genocide monument and lay flowers (usually red carnations or tulips) around the eternal flame. During a period of 100 days in 1994, officially 937,000 Tutsis and moderate Hutus were killed by Hutus in Rwanda. The rapid rate at which people were killed far exceeded any other genocide in history. Bodies were left wherever they were slain, mostly in the streets and their homes. The method of killing was done mostly with machetes. James Smith of Aegis Trust, a British NGO dedicated to the prevention of genocide, says finding an exact number is not the point: "What's important to remember is that there was a genocide. There was an attempt to eliminate Tutsis—men, women, and children—and to erase any memory of their existence." One such massacre occurred at Nyarubuye. Ordinary citizens were called on by local officials and government-sponsored radio to kill their neighbors and those who refused to kill were often killed themselves. "Either you took part in the massacres or you were massacred yourself," said one Hutu, rationalizing an ambivalent mixture of regret, fear, and shame at being forced to kill Tutsis. The United Nations established the International Criminal Tribunal for Rwanda (ICTR) for the prosecution of offenses committed in Rwanda during the genocide which occurred there beginning April 6, 1994. For many, the Rwandan genocide stands out as historically significant, not only because of the sheer number of people murdered in such a short period of time, but also because of how inadequately the United Nations (particularly, its Western members such as the U.S. and France) responded (or failed to respond) to the atrocities. A major criticism of the international community's response to the Rwandan Genocide was that it was reactive, not proactive. The international community has developed a mechanism for prosecuting the perpetrators of genocide but has not developed the will or the mechanisms for intervening in genocide as it happens. Individual nations have their own laws regarding genocide, including the possibility of prosecuting perpetrators for acts committed in other countries. Examples of such laws in Belgium, the Netherlands, Spain, and the United Kingdom are noted below. Dutch law restricts prosecutions for genocide to its nationals. On December 23, 2005, a Dutch court ruled in a case brought against Frans van Anraat for supplying chemicals to Iraq, that "[it] thinks and considers legally and convincingly proven that the Kurdish population meets the requirement under the genocide conventions as an ethnic group. The court has no other conclusion that these attacks were committed with the intent to destroy the Kurdish population of Iraq." Because he supplied the chemicals before March 16, 1988, the date of the Halabja poison gas attack, he is guilty of a war crime but not guilty of complicity in genocide. The United Kingdom has incorporated the International Criminal Court Act into domestic law. It is not retroactive so it applies only to events that took place after May 2001, and genocide charges can only be filed against British nationals and residents. According to Peter Carter QC, chairman of the Bar's human rights committee "It means that British mercenaries who support regimes that commit war crimes can expect prosecution." In the wake of the Holocaust committed by the Nazis, the Convention on the Prevention and Punishment of the Crime of Genocide (CPPCG) was adopted by the UN General Assembly on December 9, 1948. It contains an internationally-recognized definition of genocide which was incorporated into the national criminal legislation of many countries, and was also adopted by the Rome Statute of the International Criminal Court, the treaty that established the International Criminal Court (ICC). After the minimum 20 countries became parties to the Convention, it came into force as international law on January 12, 1951. At that time however, only two of the five permanent members of the UN Security Council (UNSC) were parties to the treaty: France and the Republic of China. Eventually the Soviet Union ratified in 1954, the United Kingdom in 1970, the People's Republic of China in 1983 (having replaced the Taiwan-based Republic of China on the UNSC in 1971), and the United States in 1988. This long delay in support for the Genocide Convention caused it to languish for over four decades—only in the 1990s did the law begin to be enforced. All signatories to the CPPCG are required to prevent and punish acts of genocide, during both war and peace, though some barriers make this enforcement difficult. In particular, some of the signatories—Bahrain, Bangladesh, India, Malaysia, the Philippines, Singapore, the United States, Vietnam, Yemen, and Yugoslavia—signed with the proviso that no claim of genocide could be brought against them at the International Court of Justice without their consent. Despite official protests from other signatories (notably Cyprus and Norway) on the ethics and legal standing of these reservations, the immunity from prosecution they grant has been invoked from time to time, as when the United States refused to allow a charge of genocide brought against it by Yugoslavia following the 1999 Kosovo War. To date, all international prosecutions for genocide have been brought in specially convened international tribunals. Since 2002, the International Criminal Court can exercise its jurisdiction if national courts are unwilling or unable to investigate or prosecute genocide, thus being a "court of last resort," leaving the primary responsibility to exercise jurisdiction over alleged criminals to individual states. Due to the United States concerns over the ICC, the United States prefers to continue to use specially convened international tribunals for such investigations and potential prosecutions. Examples of genocide prosecuted through international tribunals include the Nuremberg Trials in Germany, and courts dealing with the atrocities in Former Yugoslavia, and Rwanda. "The Nuremberg Trials" is the general name for two sets of trials of Nazis involved in World War II and the Holocaust. The trials were held in the German city of Nuremberg from 1945 to 1949 at the Nuremberg Palace of Justice. The first and more famous of these trials was the Trial of the Major War Criminals Before the International Military Tribunal or IMT, which tried 24 of the most important captured (or still believed to be alive) leaders of Nazi Germany. It was held from November 20, 1945 to October 1, 1946. Milan Babić (deceased), Krajina Serb, prime minister of Republika Srpska Krajina (Serb self-proclaimed entity in Croatia); sentenced to 13 years for his part in ethnic cleansing. Vidoje Blagojevic, Bosnian Serb, a Bosnian Serb Army officer, sentenced to 18 years for involvement in the Srebrenica massacre. Dragan Jokic, Bosnian Serb, sentenced to nine years for involvement in Srebrenica massacre. Radislav Krstic, Bosnian Serb, Bosnian Serb Army general; sentenced to 35 years (originally 46) for genocide, crimes against humanity, and violations of the laws or customs of war. Genocide, considered by some to be our world's only universal taboo, takes place much more often than anyone could imagine or would like to admit. Justifications by those committing such acts may include claiming their right of Lebensraum for their own group, and that others are inferior, contributing nothing of value, only threatening the smoothing functioning of society. To solve a problem of such epic proportions one must look to its roots rather than its branches. Genocide is rooted in segregation, fear, and hate. It begins when a partition is made among people, separating them into categories based on race, ethnicity, religion, or any other division. When these divisions are made in the eyes, ears, and minds of a people they may begin to fear each other, fear what is different and fear what they do not understand. This fear can become hate, and if assimilated by a government or any powerful enough group, it can lead to horrifying results. The only way to end this terrible cycle of destruction is to strive to become a global community, rather than a loosely fastened collection of distinct groups. Only when people see all of mankind as one family can people enjoy those differences rather than fear them. Only when all of the worldwide human family are bound in heart in this way will genocide become a thing of the past. ↑ Raphael Lemkin, Axis Rule in Occupied Europe (Wash., DC: Carnegie Endowment for International Peace, 1944), 79. ↑ ReligiousTolerance.orgMass Crimes against Humanity and Genocide: Past Genocide of Natives in North AmericaRetrieved December 4, 2007. ↑ Reverend Kevin Annett Hidden From History: The Canadian Holocaust: The Untold Story of the Genocide of Aboriginal Peoples by Church and State in CanadaRetrieved December 4, 2007. ↑ James Coultas Coultas, James, Pair of Manuscripts (1764) Concerning the Paxton Boys, excerpt provided by Michael Brown Rare Books: Americana.Retrieved December 4, 2007. ↑ R. J. Rummel "Exemplifying the Horror of European Colonization:Leopold's Congo" Nov 2, 2001 posting.Retrieved December 4, 2007. ↑ AMI Armenian National Institute  Original source of the telegram sent by the Department of State, Washington containing the "French, British and Russian Joint Declaration." Retrieved December 4, 2007. ↑ Republic of Turkey: Ministry of Culture and Tourism: History  "Armenian issue allegations-facts. "Retrieved December 4, 2007. ↑ Helen Vesperini "RWANDA: No consensus on genocide death toll." AFP.iAfrica: News. Online posting Apr. 6, 2004. iAfrica.comRetrieved December 4, 2007. ↑ Quoted. in The Rwanda Crisis: History of a Genocide (London: Hurst, 1995), by Gérard Prunier; report. in "Rwanda & Burundi: The Conflict." Contemporary Tragedy. Online posting. The Holocaust: A Tragic Legacy. ↑ Dutch court says gassing of Iraqi Kurds was 'genocide' by Anne Penketh and Robert Verkaik in The Independent December 24, 2005. Retrieved December 4, 2007. ↑ Dutch man sentenced for role in gassing death of Kurds CBC News, December 23, 2005. Retrieved December 4, 2007. ↑ Spanish Judge Sends Argentine to Prison on Genocide Charge by Emma Daly New York Times June 30, 2003. Retrieved December 4, 2007. ↑ BBC News Profile: Judge Baltasar Garzon BBC September 26, 2005. Retrieved December 4, 2007. ↑ Spanish courts to investigate if a genocide took place in Tibet. Spanish court to investigate Tibet massacre case Reuters report in the New Zealand Herald (January 12, 2006) Retrieved December 4, 2007. ↑ Bar Human Rights Committee "is the international human rights arm of the Bar of England and Wales. It is an independent body primarily concerned with the protection of the rights of advocates and judges around the world." 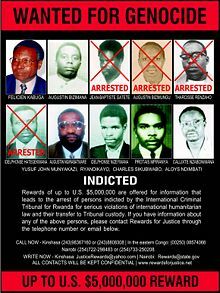 ↑ International Criminal Tribune for Rwanda www.ictr.org. Retrieved December 4, 2007.